This week, Star Trek Into Darkness (2013) opens in theaters and we now present a short profile on star Zoë Saldaña. Siblings: Has two sisters: younger sister Cisely (a director\producer) and older sister Mariel (a nurse). Geekiest Roles: Pirates of the Caribbean: The Curse of the Black Pearl (2003) as Anamari, Star Trek (2009) as Uhura and Avatar (2009) as Neytiri. Parents: Dominican father, Aridio Saldana, and a Puerto Rican mother, Asalia Nazario. When her father died in a tragic car accident when she was 9, her mother moved the family to the Dominican Republic to be with their Grandparents. Saldana discovered her love of dance and enrolled in the ECOS Espacio de Danza Acadey studying ballet, jazz, and modern Latin dance. Her family moved back to the US after her sophomore year in High School. First acting role was a guest spot on a 1999 Law and Order episode called "Refuge." Her big break came in the teen dance film Center Stage (2000) as Eva Rodriguez. She said on "Jimmy Kimmel Live!" that she is often mistaken for British actress Thandie Newton. Even her own mother gets confused when looking at pictures of them. She's sick of it. Zoe Saldaña has three tattoos: on her foot, ribs, and lower abdomen. Unfortunately, as is common with tattoos in foreign languages, they have many misspellings. She is a supporter of FINCA International, a micro-finance organization that provides small loans to help 8,000 Haitian women. Ranked #42 on the Maxim magazine "Hot 100 Women of 2008" list. She loves her hair and skin saying “In Latino culture, hair carries a lot of history, a lot of weight, and a lot of energy." Her favorite musical artists are Otis Redding, Sam Cooke, and Billie Holiday. 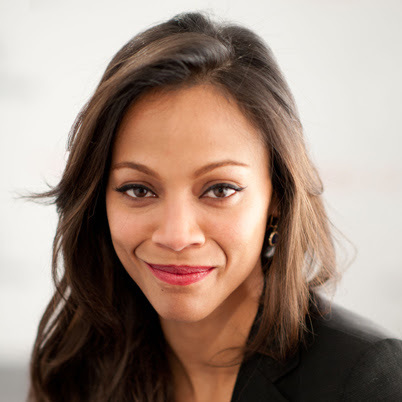 What do you think of Zoe Saldana? I can see why she shortened that name; it would be annoying to write all that on those big checks she cashed for Avatar and Star Trek. She is an attractive young lady. Isn't there a fairly huge difference between Zoe and Thandie Newton? i just love... love her, i gets giddy thinking about it... she is a strong uhura... and is almost always invited to my house... have to ask the wife. I'm going to this movie this afternoon. Can't wait to see it. Finally!!! Star Trek!! I'm going to see it at IMAX either Thursday or Sunday. Squeee! No, I'm not excited.